Jamberoo Aquaculture was established in the 1990s at Tabbagong, one of the original dairy farms in the region. The property and business was bought by Alan and Carmel Pemberton in May 2009, who have enjoyed the challenge of building the business. Our silver perch and golden perch are mainly grown in cages in our ponds. The cages offer some protection from predators and make harvesting relatively quick and easy. Yabbies are grown in all six of our ponds and are harvested from early Spring through to May. 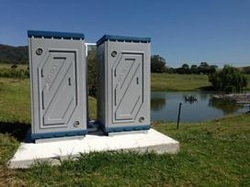 We are currently trialling two Biogill biofiltration units in one of our ponds. The BioGills have a treating membrane of 500 square metres. BioGills are simple in operation. A recirculation pump takes wastewater to the top of a bioreactor tank where the waste stream is spread across Nano-Ceramic Membranes. Gravity pulls the waste stream down through the membranes or gills and back into the treatment tank. During each pass along the gills, microbes eat the nutrients from the waste stream while the availability of oxygen feeds and protects the microbes. No chemicals are used. A number of films and TV shows have been shot here, including an episode of WIN TV's Alive and Cooking (pictured) in July 2011. We have also been featured in several magazines, including Farming Small Areas and Small Farms.